Thanks to Brainslayer and Tornado for their help. As previous topic was becoming long. So I decided to write it for users. First i want to thanks Tornado for all the help. I tryed wholeflash and nothing, still the same. Than i ask Tornado for help and now my router is alive again and works fine. Made a JTAG cable and stick in one computer with nothing runing, just windows XP pro SP2. I Wait about 5 minutes to turn off the router. Turn on again and..
ALL LIGHTS OFF and responding ping. I din´t reset the router and the power light just come ON. Now my router is alive and works fine. 1. The signal is weak, compare to linksys original firmware. 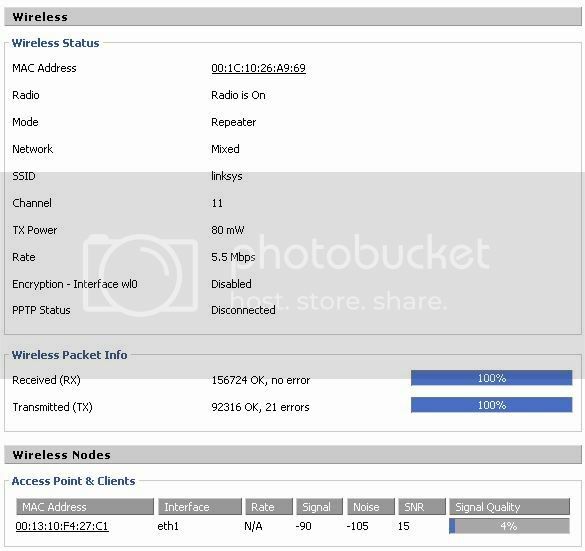 2 Repeater mode is not working, the router can receive signal from another AP (listed in "wireless nodes" as 00:13:10:F4:27:C1 - eth1 N/A -89 -105 16 6%) but can't transmitt it again. This what I have wrt54g v8.00.2 stock firmware. setup tftp ready to go. I then got a white screen with black border that said "upgrade successful rebooting" there was an ok button I pushed it and the screen stayed there. I waited 30 seconds the screen was still there. I then tftp the wrt54g v8 v8.00.0 fw. bin to the router it said " successful" I then waited 3 minutes and powered off the router and back on. The cisco light did not come on and the far right light just flashed along with the port light i could not get back into the router from my Internet explore screen. Should I have waited for the white screen that said rebooting to change to a different screen before tftp the wrt54 file? Hello there, i was able to set up my wrt54GS v7 with the dd-wrt.v24_micro_wrt54gv8.bin thats the RC5 right ? The problem is here ..... I have my original DSL modem/router as the host and the WRT54GS v7 with the dd-wrt.v24_micro_wrt54gv8.bin installed. The problem is that my girlfriend want to play in shes Xbox 360 live but dont pass the NAT step, so it said the NAT is strict, I want to open it so i can play. I know you are going to say open the ports 88 and 3074 and etc but i really did read about every method and nothing, Like static ip etc. nothing work to me !!! I need to downgrade/upgrade the firmware ? biggy boy did you tryied to re tftp again? The method for installing dd-wrt...bin firmware was in first post. What LOL I did ok i'll try but did I do the steps right? So you do not have a copy of the dd-wrt in your Tonado file? I thought you had your own version there. No, I put that there in case someone had a hard time finding that version of the original Gv8 firmware, its not online anymore, I think a different version is there now. Looks like you did all the steps right. Just remember, I modified the V3 Killer and reversions to self reboot on certain steps, powering off or unplugging at the wrong time could cause big problems. Nop, that doesnt work neither. I getting crazy with this problem. Any other recommendation ? What is happening with your router, what seems to be the problem ?